Welcome to the page of State PSC Jobs. In this page you can find the details of latest state-wise Public Service Commission’s vacancy. State Public Service Commission (PSC) is formed by Government of India to recruitment of unemployed youth for various administrative vacancies under the state Government. Common Examinations Conducted by State Public service commission is State Civil service exams, State Police service exams and State Forest Service Exams. 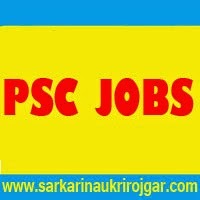 Get full details of all Latest State PSC Jobs of India. You can get all the recent employment notification of State PSC Recruitment directly in your mail inbox through our free email alert service. Name of the Posts : Assistant Editors, Associate Professor, Chemical Examiner etc. Name of the Posts : Manager, Livestock Officers, Research Officer, Deputy Curators, etc. Name of the Posts : Allopathic Medical Officer, Lecturer, Professor, Chief Fire Officer etc. Subscribe our free job alert mail for State PSC Jobs. Bookmark & Share this page to your friends who are looking for State PSC Jobs 2016.